So what is up with the studio, and what is this I hear about Patreon? 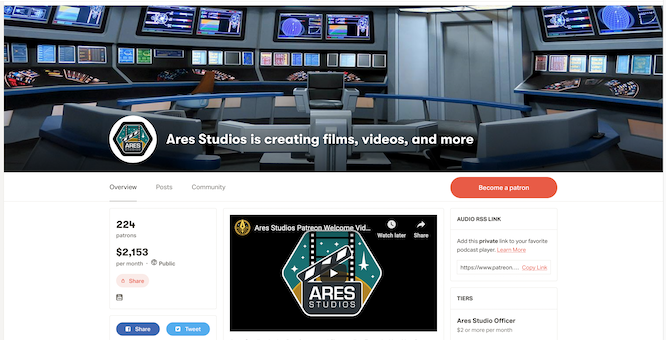 Ares Studios is a separate legal entity from Axanar Productions, which produces Axanar. The studio is where we house the sets from Axanar, and host film students from Gwinnett County, who use our sets to make their student films. 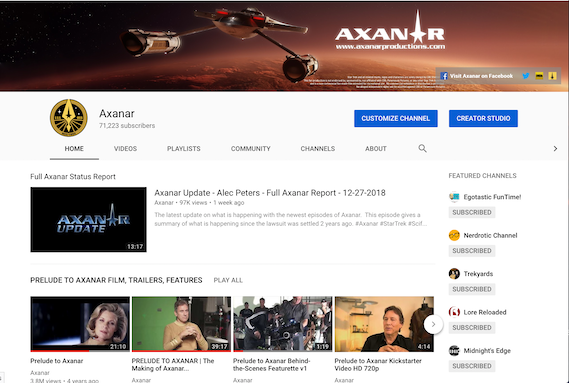 We have TWO Star Trek fan films set to film this year at Ares Studios, and or course, the next two episodes of Axanar will use the studio as well. As part of this rebranding and refocus, we have taken to two different avenues of funding the current $4,000 a month in rental, utilities and insurance we pay, as I have been paying this out of pocket for the past 5 months. With the help of John Strekis, who acts as producer of our YouTube channel, we have reignited our channel with lots of new videos and TWO weekly shows. Reel Trek at 9pm EST on Fridays, and Axanar Confidential, at 9pm EST on Mondays. Right now we are bringing in over $1,000 a month between ad revenue and super-chat donations. Our Patreon is over $2,150 now and keeps growing! Patrons get exclusive videos and content, live chats and more! So if you want to support the studio, please join in! Together we are making over $ 3,000 a month now which means we have SECURED the future of the USS Ares bridge set, as we are set to move to a smaller, brand new building, right next door, this summer. There our rent will only be $2,100 a month. Add in utilities and insurance and we are at about $ 2,500. So we can stay or we can move, but we will know as things progress.